I really really struggled to photograph this card. I had major glare issues and after about 30 different shots I ended up going with the first one I took. Typical. It's still not great but it's the best I'm going to get with my limited skills. 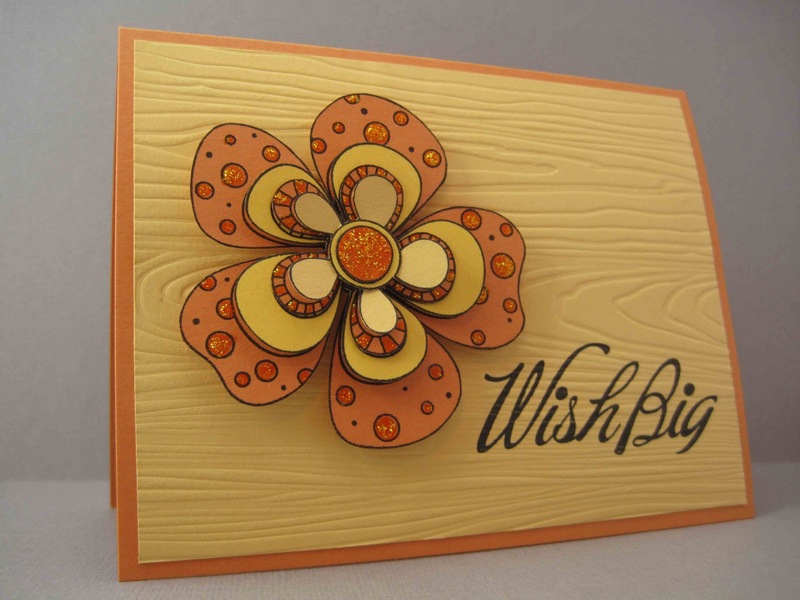 But enough of that and on to the card which I made for the Textured to Perfection Challenge in the Moxie Fab World. I used PTI's linen impression plate on the blue panel for some subtle texture but the real texture comes in on the butterfly. 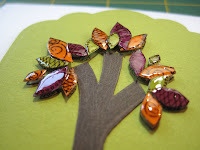 I die cut 3 different PTI butterflies from turquoise mesh and layered them to create my own embellishment. And look what's on that sentiment! Hooray for the arrival of my white embossing powder - and a touch more texture for the card! I thought it needed a bit more colour too so the white panel is stamped with my new Market Street Stamps Argyle background stamp and I coloured the gems to match it. My PTI goodies arrived just in time for me to take part in A Passion For Papertrey's Sensational Silhouettes challenge. I used a mixture of new and old stamps including stamps from Star of Wonder, Nativity Silhouettes and Mat Stack 2 Collection. I also attempted some masking (which is something I very rarely try) although I kept it pretty simple - just masking the light beams behind the medallion. The Mega Mat Stack die is new too and I really like the shape. I'm also going to enter this over at Simon Says Stamp's Anything goes challenge. This picture is for you, Kim S! You mentioned once that I always only show beautiful pictures of my view so I thought I'd share one from this grey and gloomy day today. As you can see, the dock was underwater again. We went across the harbour to our favourite pub for lunch and their outdoor eating area was close to being swamped! Apparently these tides are due to the moon, earth and sun being in a very particular alignment at the moment. Pretty fascinating how the world works huh? I needed one more birthday card for this year's staff birthdays at work so I made a bright and happy flower card using ColourQ's colours. This Hero Arts flower is perfect for layering and paper piecing and I added some Stickles to the dots and stripes for a little pizzazz. I'm also going to enter this in the Simon Says Stamp Anything Goes challenge. 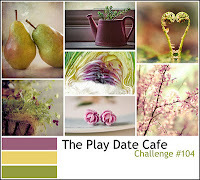 A clean and simple entry for this week's Unity Friends With Flair blog hop. 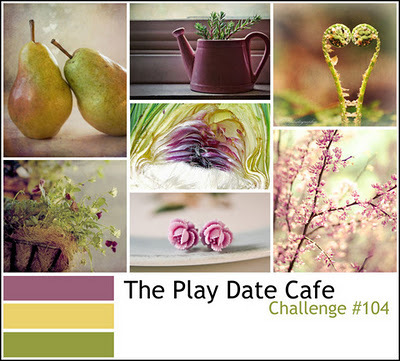 I used 3 different KOMs for this card as well as the colours from last week's Play Date Cafe challenge. The green can is from the November 2010 KOM - Picture Perfect, the yellow can is from July 2009 - Pocket Full Of... and the sentiment if from July 2010 - Happily Ever After. A real blast from the past card! And I thought I'd share a couple of pictures from home. We've had some really high tides this month and the dock has been disappearing underwater almost every day! Even the little island out in the bay has been getting almost completely swallowed up! Stamps: (Green can from Nov 2010 KOM - Picture Perfect, Yellow can from July 2009 KOM - A Pocket Full Of..., Sentiment from July 2010 KOM - Happily Ever After) Unity Stamp Co.
After having this Up, Up & Away stamp set for almost a year now it's funny that it's suddenly caught my interest and keeps appearing on cards. I'm just so bad at keeping up with the latest goodies - I always seem to be a beat behind. Ah well, better using them late than never I guess. This card is for the Embellish colours and buttons challenge. I don't use buttons too often (although they must be breeding in the Craft Cave because there sure are a lot of them around here) so it felt good to use a few on this card. The colours are kind of masculine but I don't know if those button balloons are... the jury's still out on that one! Hello and welcome to the Print Candee blog hop! 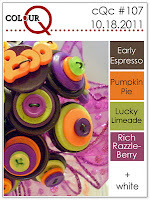 The theme this month is Fall/Spring - depending on which hemisphere you're in of course! I'm excited to be the second stop on the hop. If you haven't checked out the Print Candee blog then please stop there first so you don't miss out on any of the fun or potential prizes! For this card I decided to try and improve my digi skills and play with the images on the computer a bit more. I used the tree image from Digital Potpourri's Halloween Horrors and the leaf piles and individual leaf from the Digi Butterfly's Fall Leaves Clip Art. It took me a while to figure out the layering and rotating but I got there in the end and created this little scene. Of course, I had to have some traditional stamping in there so stamped the sentiment and layered the image on embossed card stock. Fun stuff huh? There really is a huge selection of goodies in the Print Candee store and they are always offering specials. There are also a few prizes to be won on this hop - 2 $10 Print Candee gift certificates and a $15 Two Peas in a Bucket gift certificate! To increase your chances of winning leave a comment on the Print Candee blog as well as on each of the Design Team's blogs. You will have until 11:59pm EST on Saturday, October 29th to comment for prizes. That's all from me for now. Get hopping over to Jocelyn's blog and check out her fantastic projects! I loved this Hero Arts stamp from the first time I saw it. I mean, how cute is that little bird? I thought it would go well with this week's Inkspirations colours so I finally inked it up. I fussy cut the bird from Cherry Cobbler paper and put some Glossy Accents on him for some shine. I also added some Stickles snow to the background which you can kind of see in the picture. 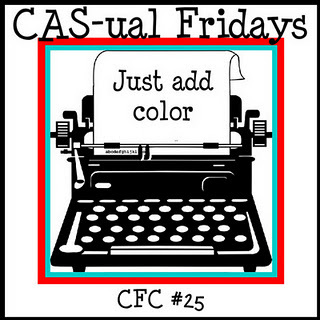 Both CAS-ual Fridays and 4 Crafty Chicks have challenged us to colour in stamped images this week. There are a lot of crafty people out there who can work wonders with their Copics (check out this bucket by Karen Baker for a jaw-dropping example) but I am not one of them so I kept my colouring pretty simple. 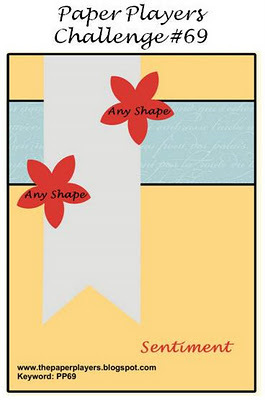 I used the Play Date Cafe colours for my palette and this lonely looking Unity pear for a simple Thinking of You card. 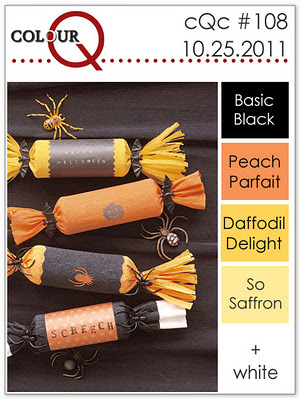 This Colour Throwdown colour combo seems to be popular this week but I guess that's not surprising with Halloween on the way. However, I've tried hard to not make Halloween cards with these. I don't have many Halloween images anyway so it wasn't too hard to avoid it. Instead, I went for a Unity image and a PTI sentiment. My white ColourBox ink didn't work as well as the last time I used it so I ended going over the sentiment with a coloured pencil. I'd have embossed it but my embossing powder is still at Bermuda Customs awaiting release. *Sigh* Hopefully they'll be gentler with it than they were with Amy's card. I really don't know what possesses me to decide to fussy cut and paper piece such tiny designs but here I've done it again! I cut lots of little leaves, popped them up on Pop Dots and added Glossy Accents to them. The colours I used are from this week's ColourQ challenge and I'm also going to enter this over at Unity's monthly challenge (Autumn Harvest), Picture Perfect Creations (Fall/Halloween Specialty Challenge) and Create's Fall challenge. I had a lovely surprise arrive in the mail yesterday. 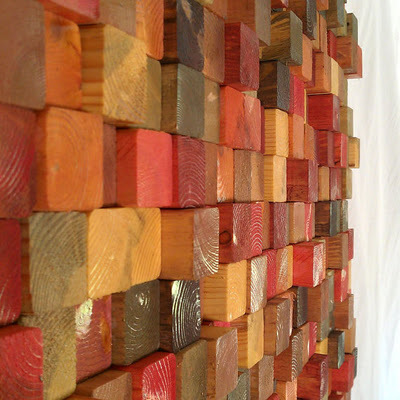 Awhile back Amy Tsuruta had asked for some crafty storage ideas and I linked her up to my Craft Cave pictures. As a thank you she sent out a little care package with stamps, notepaper, buttons and, of course, a fabulous card! I was so excited although I'm not happy with Bermuda Customs. They opened the package to "inspect" it and clearly just crammed everything back in and bent the card. :( Typical. I still love it though - especially the delicate stitching! I also realised that I never posted a picture of the fabulous card Lynn Mangan sent when I won some blog candy from her. 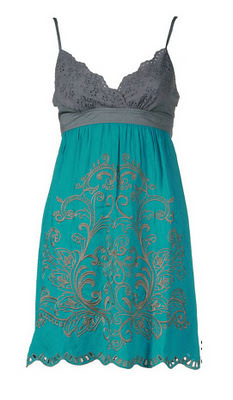 Love all the layers and PTI goodness! This week's challenge at The Paper Players is to create a CAS Christmas card using red and green. I found this cute sentiment stamp in my (very small) Stampin' Up stamp stash and decided it would be perfect for the challenge. I popped up the tree, added Glossy Accents to the letters and did a little dry embossing to make it stand out a bit.